When you choose a Chelsea, you’re getting more than a fine clock – you’re getting a piece of American history. That’s because the Chelsea story is inextricably bound with the history of our nation over the last century, especially the Navy. Chelsea has a long and storied history aboard U.S. Navy ships, one that dates back to the early 1900s when the U.S. government began ordering marine clocks. The Navy hoped to take advantage of Chelsea’s growing reputation for nautical excellence. 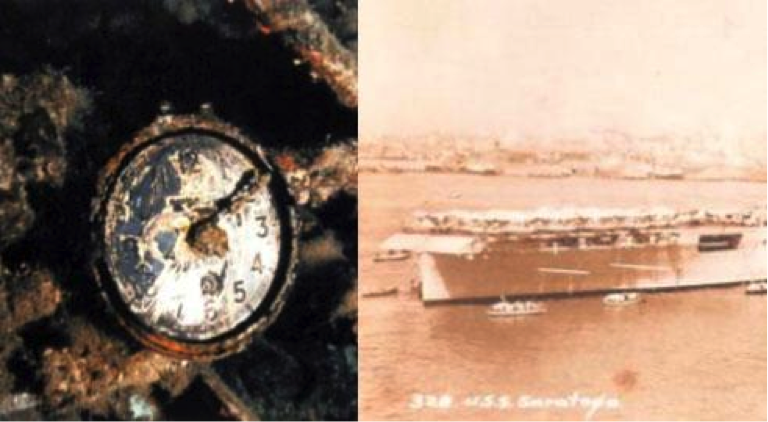 Chelsea made sure its clocks were built to Navy standards, tough enough to withstand moisture, dropping, shaking, and the rigors of life at sea. Chelsea clocks found homes on ships, destroyers, cruisers, and even submarines. One of the more noteworthy ships on which a Chelsea sailed was the U.S.S. Saratoga. Originally designed as a battlecruiser, the Saratoga was converted into one of the Navy’s first aircraft carriers during construction to comply with the Washington Naval Treaty of 1922. Saratoga saw heavy action in the Pacific during World War II, torpedoed several times and suffering severe damage from kamikaze attacks. After the war, the ship was used to test atomic bombs and eventually destroyed by one of the blasts. Today the wreckage is a popular scuba diving destination and a Chelsea clock has been photographed among its contents. Thanks to the Navy, Chelsea clocks traveled across the globe. 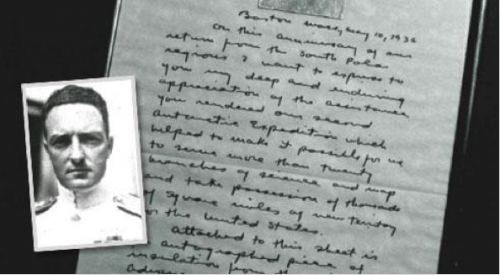 Some even made their way to the South Pole, accompanying Admiral Richard E. Byrd in his pioneering expeditions. He was so appreciative for the accuracy of for clocks that he wrote a letter of gratitude to Chelsea in 1936. When the U.S. entered World War II, the whole nation did its part to support the war effort and Chelsea was no exception. The company ramped up production in its factory and tripled its workforce just to keep up with U.S. government demand. 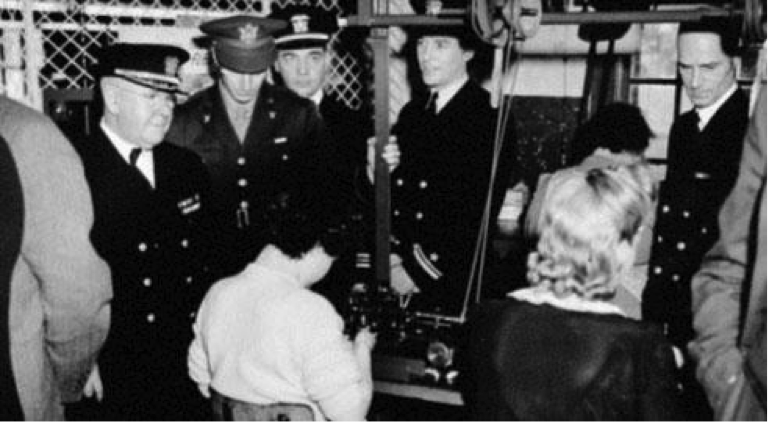 Due to the wartime shortage of metal, the Navy challenged Chelsea to make a clock tough enough for battle without using its traditional brass case. Chelsea responded with a phenolic resin case that was lightweight yet durable enough that it wouldn’t break or shatter like conventional plastic. 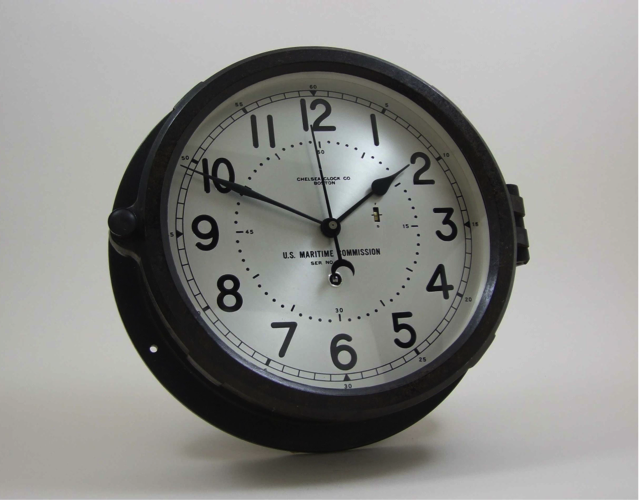 You can own a modern day version of this naval clock in the form of the Patriot Deck Clock. 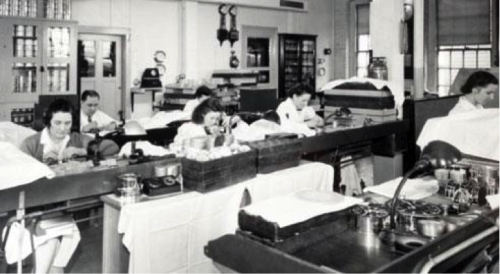 As World War II wore on, the Navy pioneered a new, faster ship – dubbed the “Victory” ship – to replace “Liberty” ships lost to German submarines, and called on Chelsea to manufacture their clocks. Hundreds of Victory ships were built and served as cargo ships and attack transports in both the Atlantic and Pacific theaters. Eventually, as many of the Victory ships were decommissioned, Chelsea reclaimed the original 1940s clocks that had served in the war. Today you can actually purchase one of these vintage clocks and own a piece of World War II history. By the time the war ended, Chelsea had produced clocks for thousands of Navy vessels. The company was even presented with the prestigious Army-Navy “E” award by the U.S. Government for excellence in the production of war equipment. Though production declined after the war, Chelsea continued to supply the Navy with clocks for the rest of the 20th century. In fact Chelsea still produces a number of mechanical and quartz timepieces for use aboard U.S. Navy and Merchant Marine vessels. You yourself can own one of Chelsea’s military-style clocks by purchasing a Patriot Deck Clock or Radio Room Clock, with only slight variations from those that we make for the U.S. military. Can you privide a list of Canadian retailers/distributors for a Chelsea Shipstrike clock please? I am a retired British Master Mariner and have in my possession an engine-room or radio room clock which an American friend gave me many years ago. He thought it was from a liberty ship of WW2 vintage. Unfortunately my friend has passed away so am trying to ascertain where the clock originated from. It is made of a black plastic like material with a brass clock inserted. It is identical to the clock shown on your opening page where there are six instruments shown and mine is the same as the bottom left clock. The clock has a vertical regulator near the 3 o’clock position and the hands are identical to your photograph. The serial number of the clock is 713882. I trust this is sufficient to give me some idea of its history. Thank you for your inquiry. According to our manufacturing log, serial number 713882 was sold to C.E. Adler & Sons Company on August 18, 1967 and is listed as an 8 ½” marine mechanical clock. Unfortunately, this is all the information that we have on record for this timepiece. I hope this is helpful. The number you mention in your email (48598e) is a U.S. government-assigned serial number which, unfortunately, is not part of our record-keeping. We would need the Chelsea Clock movement serial number (located on the brass back plate of the clock’s movement) which will have the following markings: Chelsea Clock Company- Boston, USA and then a 6-digit number. To gain access to the movement back plate, remove the three larger screws going around the outer edge of the dial and the plastic trim ring (if your clock is equipped with one). Then hold the case of the clock upright and tilt it forward so the dial and movement assembly comes out into your hand. You should see the markings mentioned on the brass back plate of the movement. Look on the back of the clock’s Bakelite case to see if the same 6-digit number is scratched into it. If it is you are lucky enough to have a non-cannibalized clock (which means its case and movement have not been swapped around for one reason or another like so many of these military clocks were). Provide us with the number located on the movement brass back plate and we should be able to tell you the year in which the movement was made and sold (or at least within a 4-year range). If you would like more specific information, such as the branch of the government that purchased the movement and the date it left the factory, you may purchase a Certificate of Origin for $35, plus shipping. Because Chelsea Clock is a civilian contractor for the government, we are not kept apprised of the whereabouts of clocks once they leave our factory. If the number on the clock’s movement does not match the number on the back side of the Bakelite case, we would only be able to issue a certificate for the dial and movement versus the complete clock. You may wish to email us both the movement serial number and case serial number (to our direct mailbox: repairs@chelseaclock.com) and we can advise if there is additional information available and how to order a Certificate of Origin. Thank you. I have a 8 1/2 Chelsea 12/24 hour clock. Black Face. Marked US Government on Face. Serial Number is 668733. It was made in 1963 according to a plack attached to the back. Any history available? I have a Chelsea USN clock that I believe is a WWII era clock. It has S/N 424188 etched on the bakelite and on the movement. In my 26 years on the Navy, I never saw one like it. It has a pushbutton release for the bezel and the hinge is on top. It has a F/S adjustment on the face between the 2 and 3 o’clock position and a stop/start sliding switch on the outside edge of the 2 o’clock position. I have a Chelsea Clock co. US NAVY 2400 clock. US NAVY SERIAL NUMBER 30672E. serial number on clock movement is 821927. Case number is B-6902. CAN ANYONE TELL ME THE YEAR, HISTORY ETC OF THIS CLOCK? I bought a Navy deck clock today at an auction. The clock is dated 1941 and has the serial #28264 on the face of the clock. Please could you help me identify what ship this deck clock could have been on. Thanks for your time. I have a Navy Chelsea Clock that supposedly served aboard a Navy Submarine. It has the serial Number of 70951E. I would like some information in regards to this clock, if you still have the original assignment given this clock, please let me know. Thanks. Dr. Terry Cleaveland. My children needed URL – IRS W-2 earlier this week and encountered a company that hosts a lot of sample forms . If people are interested in URL – IRS W-2 too , here’s https://goo.gl/QNBwdf. I bought a Chelsea Navy clock (Ser no 111190). Do you have some information on the piece like the year is has been made, and maybe the ship is was on? Thank you. I have a 7″ heavy brass Chelsea Navy Clock but I have never found one with the same face as the one I have. It just says U.S. Navy inder the center pin for the hands. All other faces seem to have mor information like a serial number. Under the 12 is the usual Chelsea Clock Co. Boston. Can anyone help with the date or model or info why it only has u.s. Navy? According to our manufacturing log, serial #315582 is listed as a barograph movement (not a clock). It was sold to J.P. Friesz & Sons on August 22, 1942. Unfortunately, that is all the information that is available. Thank you. According to our manufacturing log, this clock case is listed as a 6″ Marine Mechanical Clock, originally sold to the U.S. Navy Dept. on December 2, 1943. However, the movement serial number does not match, which leads us to believe it was taken from another clock case. Unfortunately, that is all the information that we have on this piece. Thank you! Hello, I have a USN Deck Clock No 2 which bears number 9096 stamped on its back. No serial no. on the faceplate. This clock has been in our house for who knows how many years. I would like to have it restored and will send in a repair estimate request. However, in the meantime, would you have a general idea of where this clock may have belonged? Thanks. Thank you for your inquiry. Unfortunately, the serial number you have provided does not match any listing in our manufacturing log. If you could provide the serial number stamped on the movement, that may provide more helpful. You may find more information about our clock repair & restoration services by visiting http://www.chelseaclock.com/p/repair-restoration/ . Thank you! Hi, are you able to tell me where serial # 107889? Thanks! has been in our family for at least seventy years and has always been reputed to have been on a warship/tanker in the Grand Harbour Malta during WW11. I wonder if you could help me trace the warship/tanker it belonged to. N 9935 1941. SN309998. Just wondering if you could give me an idea of who purchased this clock originally.